You Can Do Something to Take Control of your Health. Would you like to do the things in life that you enjoy – spending time with your children and grandchildren, gardening, hiking, traveling, dancing, the list is endless – rather than being burdened by disease and lack of mobility? Look at it this way, you can spend about $20 and less time to begin a path of wellness, or you can exhaust the time becoming unwell, while spending hundreds, if not thousands, of dollars on doctor visits, co-pays, medicines, medical tests, and procedures. My program has worked for countless older adults in helping them to stay fit and keep moving. Note: Always consult your doctor before beginning any fitness program. Video: DVD / 57 minutes. Stretch band: Perfect thickness and weight for the best stretch. Colors vary. REDUCED PRICES & FREE SHIPPING. Perfect thickness and weight for the best stretch. Colors vary. 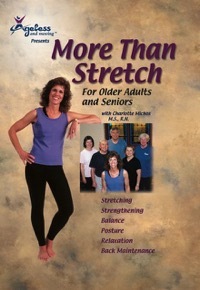 How can “More Than Stretch” transform your life? • Rebuilding and Maintaining a Healthy Back. This is fitness for the whole body, inside and out – it spreads to your mind and your spirit, permeating all aspects of your everyday life, enabling you to do the things in life that you enjoy doing. NEW: Check out my BestHealthConsultant.com website. Note: Always consult your doctor before beginning any fitness program.